Tissue processing is concerned with the diffusion of various substances into and out of porous tissues. Diffusion results from the tendency of processing reagents to equalize concentrations both inside and outside blocks of tissue. The reagent molecules diffuse down a concentration gradient and move from where they are at a high concentration to where they are at a lower concentration. This movement requires no energy since it always progresses down the concentration gradient. There are significant variables which need to be considered when processing tissue and these include the operating conditions (such as temperature), the concentration of the reagents and the properties of the tissue. 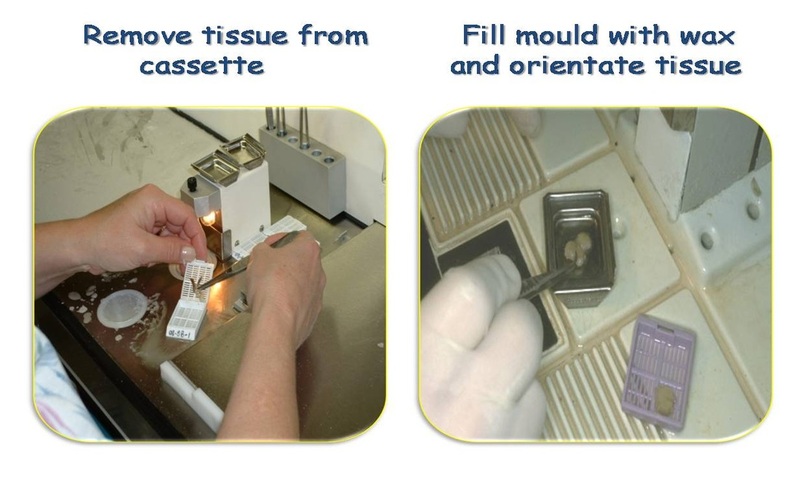 In the histology laboratory, conventional tissue processing describes the stages required to take fixed tissue samples through dehydration and clearing to the state where it is completely infiltrated and embedded with a suitable medium (normally paraffin wax) in readiness for cutting sections on a microtome (microtomy). For routine purposes, tissues are most conveniently processed through dehydration, clearing and infiltration stages automatically. There are two broad types of automatic tissue processors available - tissue transfer and fluid transfer types. These processors are characterized by the transfer of tissues, contained within a basket, through a series of stationary reagents arranged in-line or in a circular carousel plan. The rotary or carousel is the most common model of automatic tissue processor, and is provided with 9-10 reagent and 2-3 wax positions, with a capacity of 30-110 cassettes depending upon the model. Fluid agitation is achieved by vertical oscillation or rotary motion of the tissue basket. Processing schedules are card-notched, pin or touch pad programmed. These processors allow maximum flexibility in the choice of reagents and schedules that can be run on them. These machines have a rapid turn-around time for day or night processing. In more recent models the tissue basket is enclosed within an integrated fume hood during agitation and transfer cycles thus overcoming the disadvantages of earlier styles. In fluid-transfer units, processing fluids are pumped to and from a retort in which the tissues remain stationary. There are 10-12 reagent stations with temperatures adjustable between 30-45°C, 3-4 paraffin wax stations with variable temperature settings between 48-68°C, and vacuum-pressure options for each station. Depending upon the model these machines can process 100-300 cassettes at any one time. Agitation is achieved by tidal action. Schedules are microprocessor programmed and controlled and can be viewed on a screen (see image below). Vacuum-pressure cycles coupled with heated reagents allow effective reductions in processing times and improved infiltration of dense tissues. Fluid-transfer processors overcome the main drawbacks of the tissue-transfer machines. Tissues are unable to dry out within the sealed retort and reagent vapours are vented through filters or retained in a closed-loop system. Processors are provided with alert systems and diagnostic programmes for troubleshooting and maintenance. A processor log should be kept in which the number of specimens processed, processing reagent changes, temperature checks on the wax baths and the completion of the routine maintenance schedule, is recorded as an integral part of the laboratory quality assurance programme. The first stage in tissue processing is dehydration (the removal of water). In tissues, water is present in both free and bound forms and needs to be removed before processing can continue. Dehydration is usually carried out using alcohols (such as ethanol) but these can dissolve certain cellular components such as lipids. Although dehydration can also cause tissue shrinkage, the stage is necessary in all infiltration methods, except where tissues are supported by an aqueous embedding medium (such as water-soluble waxes). In paraffin wax processing, dehydration from aqueous fixatives such as formalin is usually initiated in 70% alcohol before progressing through 90%-95% to absolute alcohol before proceeding to the clearing stage. However, direct transfer to 95% alcohol is often performed if tissues are adequately fixed. Duration of dehydration is dependent on tissue thickness; the thicker the block, the longer the time. Generally, blocks 1 mm thick should receive up to 30 minutes while blocks 5 mm thick require up to 90 minutes or longer in each change. This is a colourless flammable liquid with a characteristic odour, low toxicity and is freely miscible with water and organic solvents. Acetone is fast and effective as a dehydrant and may also act as a coagulant secondary fixative. Acetone is ideal for fatty tissue samples and they can be transferred directly from acetone into paraffin wax. These are clear, colourless, flammable and hydrophilic liquids that are miscible with water and most of the organic solvents. In addition to their role as dehydrants, alcohols also act as secondary coagulant fixatives during tissue processing. The most commonly used alcohol used in tissue processing is ethanol. This alcohol is mainly used for plant and animal tissues. N-butanol causes less hardening and shrinkage than ethanol but is poorly miscible with water and paraffin wax so longer times are required. It is flammable, has a penetrating odour and is an eye irritant. Iso-butanol has similar properties but is a less costly substitute for n-butanol. Also known as ethylene glycol or 2-ethoxyethanol, it is a colourless, almost odourless flammable liquid. The reagent is miscible with water and most other organic solvents. As a dehydrating agent, it is especially used for preceding ester wax embedding. In order to avoid severe tissue shrinkage, they are transferred from aqueous fixative or 70% ethanol into full strength cellosolve. These are flammable, miscible with wax and are used for the chemical dehydration of tissues. They are suitable for rapid manual processing or machine processing and are comparable to conventional dehydration for tissue morphology and staining reactions. Also known as diethylene dioxide, this is a colourless, flammable liquid that produces less shrinkage and hardening than with ethanol. The liquid is miscible with water, most organic solvents and paraffin wax and is excellent for tissues that have been excessively hardened by conventional processing. Dioxane has a rapid but gentle action and tissues are able to remain in it for long periods without harm. This is a rapid and efficient dehydrant and is the most commonly used. Dehydration is usually initiated in 75% alcohol with progress through 90%-95% ethanol before several changes of absolute ethanol to complete dehydration. Progressive removal of bound water from carbohydrates and proteins during prolonged immersion in absolute ethanol causes tissues to harden excessively and become brittle. Colloid, blood, collagen and yolky tissues are particularly affected. Ethanol is usually supplied as absolute ethanol or industrial methylated spirits (IMS) which is also known as 74 O.P (over proof) spirit. This is completely miscible with water and most organic solvents and is fully miscible with molten paraffin wax. Isopropanol shrinks and hardens tissues and is used to dehydrate hard, dense tissues. It is less severe than ethanol but tissues may be transferred from 60%-70% to absolute isopropanol to minimize shrinkage. Isopropanol can be used as a xylene substitute. This reagent is a good ethanol substitute but is rarely used because it is volatile, flammable and costly. Methanol tends to harden tissues more than ethanol and is a poor lipid solvent. This consists of clear hygroscopic crystals and is also available in a liquefied form. Phenol is soluble in water, alcohol and most organic solvents. However, phenol develops a pink discolour on exposure to air and light so containers must be protected from light and tightly sealed. These are used to dehydrate and embed tissues that are affected by the solvents and heat of the paraffin wax method. They are clear, viscous liquids or solids of low toxicity. At low molecular weight, the polyethylene glycols are liquid and can be used to dehydrate the tissues as they pass through glycols of increasing molecular weight and viscosity. However, at room temperature, high molecular weight polyethylene glycols are solid and can be used for embedding tissues. This is a colourless, highly volatile and flammable solvent with an offensive smell. The solution is completely miscible with water, most organic solvents, paraffin wax and mounting media. It dehydrates rapidly causing little shrinkage or hardening and is possibly the best of the universal solvents. Clearing is the transition step between dehydration and infiltration with the embedding medium. Although tissues are water-free following dehydration, infiltration with wax cannot be carried out because wax and ethanol are largely immiscible. Many dehydrants are immiscible with paraffin wax and a solvent (clearing agent or ante medium) miscible with both the dehydrating agent and the embedding medium is used to assist the transition between these steps. The term clearing arises because some solvents have a high refractive index. When dehydrated tissues are placed into these reagents, they are rendered transparent. This property is used to determine the endpoint and duration of the clearing step since the presence of opaque areas indicates incomplete dehydration. Clearing agents are fat solvents and therefore remove fat from the tissue. It must be noted that shrinkage occurs when tissues are transferred from the dehydrating agent to the clearing agent and from the clearing agent to wax. In the final stage shrinkage may result from the extraction of fat by the clearing agent. Xylene is the most popular clearing agent and several changes of it are required to completely displace the ethanol. The choice of a clearing agent depends upon the type of tissue processor used, the processing conditions such as temperature, safety factors and cost. These are chiefly used as nitrocellulose solvents in double embedding techniques. They have low toxicity, but their strong penetrating odours necessitate good laboratory ventilation. They are ideal for manual processing as tissues may be left in them for extended periods without hardening. These esters are difficult to eliminate from paraffin wax and should be extracted from tissues with one or two brief changes of toluene or similar solvent before passing through two or three changes of wax. Methyl benzoate and methyl salicylate render tissues completely transparent and are used for clearing helminthes parasites for examination and whole mounting. Methyl salicylate clears tissues from 96% ethanol, hardens less and has a more pleasant odor than methyl benzoate. It causes minimal tissue shrinkage and hardening and tissues can remain in it indefinitely without harm. This ester is one of the best though expensive transition solvents. Benzene is more gentle and rapid than xylene and toluene and is probably the best transition solvent However, its toxicity and carcinogenicity has preclude its use in histology. This is used as a xylene substitute and nitrocellulose solvent. Because of its high toxicity it is now rarely used in histology. This is largely composed of cedrene, rapidly clears tissues from 95% alcohol, hardens tissues the least of all the transition solvents, but is difficult to eliminate from tissues during wax infiltration. It is particularly useful for processing dense tissues such as uterus or scirrhous carcinomas, and has a role in forensic histopathology in processing the hardened skin margins of electrical burns and bullet wounds. Tissues can remain in cedarwood oil indefinitely without harm. Low viscosity refined oil should be used for clearing. Formation of crystalline cedrol in cedarwood oil can be overcome by the addition of 1 ml xylene or toluene to 80 ml cedarwood oil. Cedarwood oil is expensive, but exhausted oil can be restored by filtering, then heating to 60°C under vacuum for 30-60 minutes. This is an expensive, volatile but slowly penetrating solvent. It causes less brittleness than xylene and is often used on dense tissues such as uterus. However, it attacks some plastics and sealants so is not generally recommended for enclosed processors. This is derived from citrus fruit and is a component of various proprietary blends of transition solvents such as Histoclear and Citroclear marketed as xylene substitutes. It is less viscous than cedarwood oil and is similar to the esters in clearing action and in elimination from wax. Limonene may cause allergic skin reactions. Terpenes are isoprene polymers found in essential oils originally derived from plants, though some are now synthesized. They are the earliest transition solvents to be used in histology and include turpentine and oils of bergamot, cedarwood, clove, lemon, origanum and sandalwood. In general the natural oils are not highly pure compounds but contain several substances. Many terpenes clear tissues and celloidin sections from 80%-95% alcohol, render tissues transparent and have a slow gentle non-hardening action. Most are generally regarded as safe though some have particularly strong odours which can be overpowering, requiring good laboratory ventilation. Tissue penetration is aided and shrinkage minimized by diluting viscous terpenes. Terpenes have low evaporation rates and are difficult to eliminate from paraffin wax, necessitating one or two 30 minute changes of toluene or similar solvent to remove the terpene before infiltration with wax. Brief immersion in toluene does not negate the effectiveness of the terpene. Alternatively, tissues are given three, four or more changes of wax until the terpene has been eliminated. Although biodegradable, terpenes are not water miscible and should not be flushed away with water, but disposed of by recycling or incineration. This is commonly used as a xylene substitute and is a component of agents such as Inhibisol and CNP30. These solvents are stable to light but tend to slowly liberate hydrochloric acid on contact with water. Because of their high volatility, members of this group may achieve and exceed maximum allowable concentrations in poorly ventilated laboratories far more rapidly than xylene under the same conditions. These agents clear rapidly and tissues are rendered transparent, facilitating clearing endpoint determination. Concerns over the exposure of personnel to xylene relate mainly to the use of the solvent in coverslipping rather than in processing and xylene substitutes can be used in these circumstances. Xylene hardens tissues fixed in non-protein coagulant fixatives and prolonged clearing in the solvent should be avoided. Industrial grade xylene may contain nearly 25% of other solvents such as ethyl benzene, with traces of benzene, odorous mercaptans and hydrogen sulphide. Only the sulphur and benzene-free solvent-grade xylene should be used for histological purposes. This is the saturation of tissue cavities and cells by a supporting substance which is generally the medium in which they are finally embedded. The most common agent of choice is paraffin wax which is molten when hot and solid when cold. An infiltrating and embedding medium should ideally be molten between 30°C and 60°C and suitable for sectioning. Additionally, the properties of the medium should be similar to those of the tissues to be sectioned with regard to density and elasticity. Various substances have been used to infiltrate and embed tissues in readiness for eventual section cutting or microtomy. The use of vacuum infiltration is often used to help complete impregnation of tissues with wax. This is carried using a molten wax or other medium under reduced pressure. Vacuum assistance helps to not only reduce the time tissues are subjected to heat but it also assists in the complete removal of any remaining solvent. Modern tissue processors are equipped to deliver vacuum and pressure during tissue processing. Paraffin embedding is the standard method used in histology laboratories to produce blocks of tissue for section cutting (microtomy). This process is usually carried out using an embedding centre and involves surrounding the tissues by a medium such as paraffin wax which when cooled and solidified will provide sufficient support for section cutting or microtomy (see stages below). The production of properly oriented and accurately labelled blocks is one of the essential skills of trained histologists and includes knowledge and understanding in areas such as tissue sampling, identification and human anatomy. This is used mainly for preparing sections of soft tissues of mixed consistency such as eyes and brain. No heat is required, and the resultant block has a rubbery consistency which gives good support to the tissues. Disadvantages include inability to cut thin sections, storage of blocks in alcohol and speed of technique (which can take several weeks or months). This is harder than paraffin wax and has a lower melting point (46-48oC). Good for cutting hard tissues since it does not crumble. Paraffin wax is a polycrystalline mixture of solid hydrocarbons produced during the refining of coal and mineral oils. Wax hardness (viscosity) depends upon the molecular weight of the components and the ambient temperature. High molecular weight mixtures melt at higher temperatures than waxes comprised of lower molecular weight fractions. Paraffin wax is traditionally marketed by its melting points which range from 39°C to 68°C. Tissue-wax adhesion depends upon crystal morphology of the embedding medium. Small, uniform sized crystals provide better physical support for specimens through close packing. Early histological wax formulations have largely been replaced by uniform, high quality proprietary blends of histological paraffin waxes. Additives recently incorporated in proprietary waxes include plastic polymers such as polyethylene wax (which improves adhesion, hardness and plasticity) and dimethyl sulphoxide (DMSO) which has the ability to reduce infiltration times and facilitate thin sectioning. These epoxy and acrylic resins are used mainly for the preparation of very thin sections (eg renal and lymph node biopsies) and in the production of undecalcified sections of bone required in the diagnosis of metabolic bone diseases such as osteoporosis and osteomalacia. Lower temperatures protect tissues from the destructive effects of processing reagents. At these temperatures, structural elements of tissues are stabilized against the destructive effects of solvent changes. Unfortunately at low temperatures reagent viscosities increase and diffusion rates decrease which result in prolonged processing times. Although mild heat can reduce processing times considerably, it may increase shrinkage. Tissue shrinkage during infiltration in paraffin wax results mainly from the effect of heat on collagen. High infiltration temperatures cause marked tissue shrinkage and hardening which can be avoided by maintaining embedding waxes 2-3°C above their melting points. Prolonged immersion in paraffin wax at the correct temperature results in only slight tissue shrinkage though tissues such as blood may harden and become brittle. The extent to which tissues are affected during paraffin wax infiltration depends upon the combination of fixative, dehydrant and solvent used as well as the tissue type. Microwave processing involves internal heating with reduction in duration. High pressure facilitates infiltration of dense specimens with the more viscous embedding media. Positive pressure for fluid transfer is probably too low to have a significant influence on infiltration. Vacuum applied during dehydration, clearing and infiltration improves the quality of processing in tissues such as lung which become de-aerated during the process. However, duration of wax infiltration is dependent upon viscosity and is not generally reduced by applying a vacuum. Agitation of tissues during processing ensures an adequate fluid exchange and in automatic tissue processors, continual motion of tissue containers and flow of processing fluids is maintained. Fluid interchange between processing reagents and tissues is promoted by exposure of the maximum tissue surface area. Therefore, tissues should be loosely packed in baskets to facilitate exchange of reagents and increase diffusion. Ideally, the cassette perforations should be perpendicular to the fluid flow. If tissues are allowed to settle on the bottom of a container or are too tightly packed, tissue surface area available for fluid exchange will be severely restricted. A microtome is a tool used to cut extremely thin slices or sections of tissue for light microscopy studies. The most commonly used microtomes in the histology laboratory are the rotary and sledge varieties (see images below). Microtomes use steel, glass, or diamond blades depending upon the specimen and thickness of the section required. 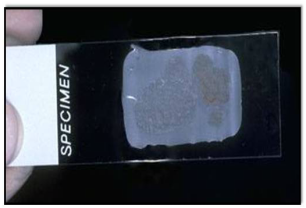 Nowadays, disposable steel blades are generally used to prepare paraffin sections of tissues for light microscopy histology. These paraffin sections are then placed in a 60°C oven in order to melt the wax which helps to adhere the sections to the slide in readiness for the next stage of staining.